Sheldon Collings will be among the locals to watch at Grand Lake this week. A soda can. A rock. Pint-sized bass. More rocks. 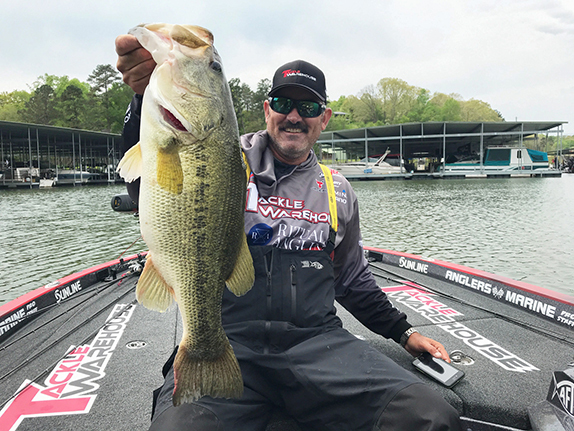 That�s just a quick summary of some of the social media content that�s been posted by anglers illustrating their preparations for the Grand Lake FLW Tour this week. Riveting stuff. The fishing can�t be that bad, though, can it? According to some competitors, trying to decipher ways to get bites in practice at Grand was on par with a root canal without Novocaine. When the field of 165 anglers got their first look at Grand on Sunday, they weren�t the only ones struggling out there. Later that day, results of the 173-boat Extreme Fishing League (XFL) team tournament that originated out of Wolf Creek began to circulate. While 27.89 pounds took the win, there were just 18 limits caught and 260 fish in total weighed in. With the umbrella rig in play, 84 teams failed to weigh a fish. 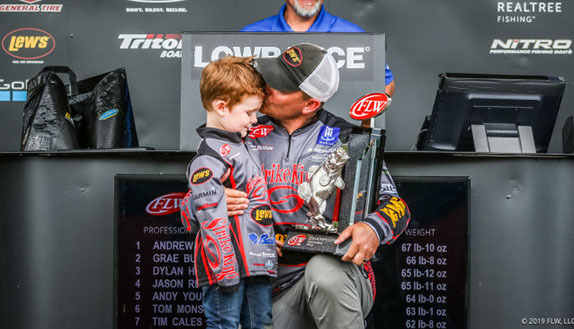 The fish that were caught, however, were of decent quality � 3.18-pound average, including nine 6-pounders � but for nearly 350 local anglers to struggle to such an extent certainly got the attention of the visiting FLW Tour anglers. With the water a couple feet above normal pool and warming up (some reported seeing 60-degree water on Tuesday afternoon), the conditions seem to be setting up for the fish to start flooding the banks. One guide on the lake likens the scenario to when the Elite Series visited in late April last year. However, the water clarity seems to be the biggest sticking point at this juncture. With the exception of the Elk River area and a few main-lake pockets, much of Grand is heavily stained to muddy and the fish seem to be in no hurry to get shallow. Some feel that if water had been let out of the lake, areas would have cleared up by now, but water releases from the lake were kept to a minimum last weekend as the Big Meat Run, a popular off-road event, was taking place below the Pensacola Dam. With a warming trend in place, at least for the first couple days of competition, competitors have found themselves trying to predict where fish may be heading if they decide to move at all. For the time being, a lot of fish seem to be off shore, stationed around clouds of baitfish, making them next to impossible to catch, especially in the dirty water. Amidst the challenging conditions, it�s expected the contingent of Oklahoma anglers � there are 12 in the field � and those with extensive experience at Grand will have a leg up on their competitors. Limits are expected to be at a premium and it�s feasible to think that 14 pounds over the first two days might be enough to get a check. Chad Warren is another Oklahoma angler with a strong track record at Grand Lake. To hear Hal Sisco tell it, the Tour pros are seemingly at a different lake than the one he regularly guides at. Sisco, who owns and operates South Grand Bass Guide Service, says he believes a recent warm spell should have the fish heading to obvious pre-spawn target zones. Granted, Sisco may be guilty of peddling a bit of local guide hyperbole, but his mention of a significant shad kill due to a cold snap in mid-February lends some credence to the theory that the bass are presently content to stay where they�re at. Nonetheless, he believes there is a good population of fish that has already moved into pre-spawn areas. Sisco expects the standard pre-spawn Grand Lake baits to be effective this week � big single-blade spinnerbaits in the back third of creeks and pockets, square-bill crankbaits around docks and any hard cover along with a jig. �I�d run-and-gun everything,� he said, adding he thinks the winning fish will come out of water no deeper than 10 to 12 feet. 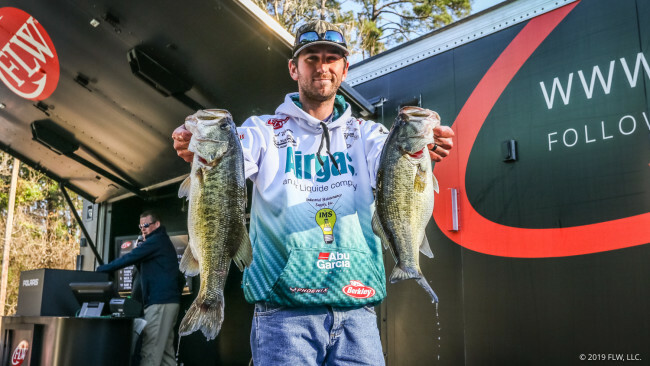 He said he�s noticed times where the lake seems to feel the effects of all the tournament pressure it receives, but when it comes to this time of year, the lake seems to shine. �I really don�t know why, but it�s been incredibly tough. The only thing I can gather is when we were at Toho, there was a major shad kill here and I�m guessing they ate and ate and are in no hurry to get to the bank. With the water being the color that it is, the primary areas that normally produce are a little muddy. That narrows down what baits you can throw and how to approach those fish because the fish haven�t moved up on the banks. �Tuesday was a warmer day and it�ll be interesting to see what happens after a day off. I�ve been to Fort Gibson and Bull Shoals before and it�s amazing how quick they react to a temperature change. It could get really good overnight, who knows. �Our cold winter is still hanging around and it�s not letting them do their thing. It�s rare to see the water this high this early, but we�ve had such a wet winter. Jeremy Lawyer has extensive experience at Grand and says the more the sun shines on the lake the better, especially at this time of year. �I know everybody is struggling, but I think the best fishing day we�ll see will be the first day of the tournament. It was sunny Tuesday and sunny Wednesday and Thursday will be the first warm day following a warm night. These fish are starved for sunshine and every little bit helps. I�m optimistic, but every day of sun and warm nights will help them. �I can see fish on the graph but we�re trying to catch �em where they�re not at. With the dirty water, you can�t really target them successfully where they�re staging so it�s a waiting game. Legitimately, I caught one 10-inch bass in 3 days. I started feeling (the frustration) Tuesday afternoon. I know I don�t stink this bad. �I�ve been here once and caught �em good. They live here, but you can�t even get a bite � like all day. I�ve been wracking my brain about it. I don�t think anybody is lying. The water is setting up perfect. It�s dirty. It�s not low. I saw it get up to 63 degrees Tuesday. I don�t know why the bass aren�t on the bank in April when the water is 60 degrees. 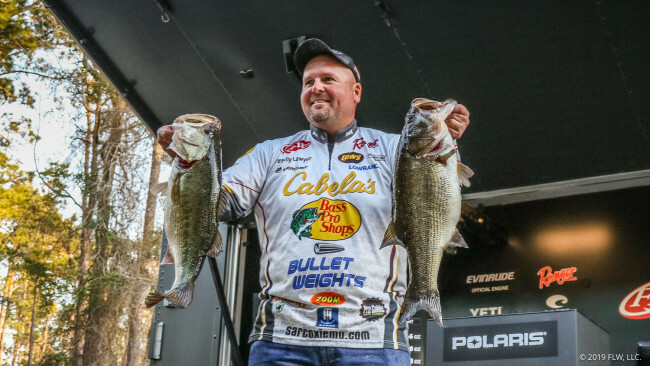 > Chad Warren � Started the year with a top-5 at Sam Rayburn, but his finishes have slipped since then. He has an extensive and successful history at Grand so don�t expect his slide to continue this week. > Bradley Hallman � Two-time Tour winner has had this one circled on his calendar since the schedule was announced last summer. He�s off to a slow start (61st at Seminole is his best finish in 2019) so maybe competing in his backyard will turn his season around. > Sheldon Collings � A native of Grove, he�ll have all the support he can ask for, but with that comes pressure. He�s fresh off a 3rd-place effort at Seminole and had four top-10s at Grand in FLW/BFL competition. 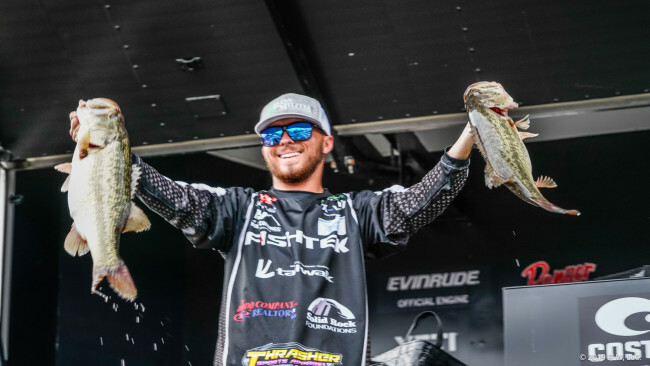 > Bryan Thrift � Fresh off a runner-up finish at the Lake Chickamauga Southeastern FLW Series, he�ll be looking to rebound from a 130th-place showing at the Lake Seminole FLW Tour earlier this month. He was the runner-up to Jason Christie at Grand in the 2013 FLW Tour event there. 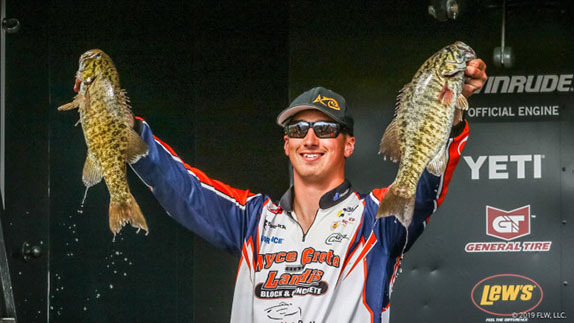 > Jeremy Lawyer � Hails from Missouri but calls Grand his home lake and he�s been strong there in the past. Currently sits in 9th in points, so he has a big opportunity to solidify his standing or make a move toward the top with a solid showing this week. > The field will blast off at 7 a.m. CDT each day from Wolf Creek Park in Grove, Okla. Day 1 and 2 weigh-ins will begin at 3 p.m. at the same location. Day 3 and 4 weigh-ins will begin at 4 p.m. at the same location.